My volunteering life started in 2011, when I joined the committee of my student union’s LGBT society. I enjoyed this experience immensely and left with a heavy heart in 2014 when my time at University came to an end. Around the same time, my partner Sally attended the STUC LGBT conference, where a LEAP Sports staff member was giving a presentation to recruit volunteers for Pride House Glasgow. We thought this sounded like an exciting and fulfilling opportunity, and both decided to sign-up. The opportunity came at the perfect time for me as I was at a bit of cross-roads in my professional life, unsure where my future was heading after university. Volunteering at Pride House Glasgow gave me something to focus on, and allowed me to recapture that sense of purpose and belonging from making a meaningful contribution to the LGBTI community. Volunteering has become an important part oy my life over the last 5 years. I’m passionate about breaking down barriers and tackling some of the challenges faced by people in the LGBTI community. Having learned more about LEAP Sports and the work that they do during Pride House, I realised that there was more I could do to contribute. When I left University, I thought that my life as an LGBTI activist was over. However, working with LEAP allows me to maintain a part in that community and get involved in different projects that I wouldn’t otherwise be exposed to. It’s a huge departure from my day job as a Chemist, and a great way to set new challenges for myself! Through volunteering, I’m always meeting a diverse range of passionate and interesting people. It’s not just about expanding my network of useful contacts; I’ve also met people who I now consider to be genuine close friends. There’s a huge sense of satisfaction and pride that comes from knowing that you’ve personally made a difference to someone who might be struggling. Many of the events that I’ve helped to organise and plan with LEAP, alleviate social isolation within the community, and introduce people to new clubs and activities which are beneficial for their mental and physical wellbeing. I feel that I have also personally benefited from these opportunities, as it has encouraged me to be more active and take better care of my own physical health. My initial volunteering stint at Pride House Glasgow surpassed all of my expectations. I was able to get involved in a huge variety of different activities and found myself rediscovering skills that I’d forgotten about! I found myself painting, approaching strangers at Glasgow Pride to tell them about our events program, meeting politicians, setting-up a Twitter wall, taking photographs and generally having the most fun I’d had in a long time, so deciding to stay on with LEAP Sports was a no-brainer! There are plenty of challenges involved as we run a huge number of events throughout the year with a limited number of staff and volunteers. However, I see this as a positive thing as it gives us all the chance to push ourselves and to develop new skills. Volunteering gives me the confidence to try new things and to be more outgoing. I feel that I’m able to go that extra mile because the end result is something that’s designed to help others. My personal highlight from Pride House Glasgow was helping out with the attempt to get additional patrons on board. 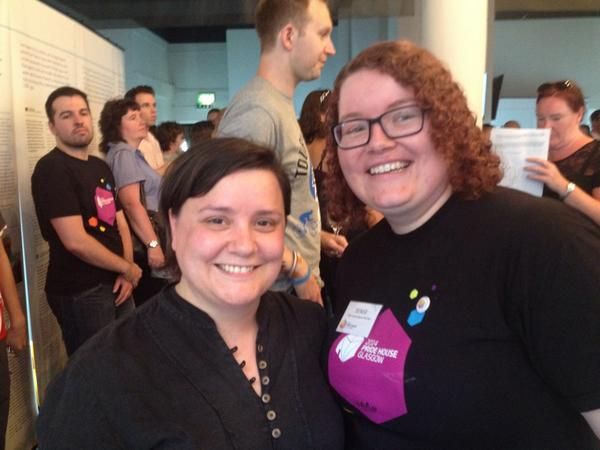 One my favourite comedians, Susan Calman, agreed to take part after I emailed her, and I was able to meet her and get a picture taken at the opening ceremony. Over the last year, I have particularly enjoyed helping out at LEAP’s first ever equality run in Stirling, and the Diverse Identities in Sport Conference which was a fantastic learning opportunity. I’m really looking forward to many upcoming events, including Festival Fortnight 2016, Pride House for the Homeless World Cup, and this year’s Pride Youth Games. I would recommend volunteering to anyone who asked me about it! Many people probably think that they don’t have time to volunteer, or that it’s too much of a commitment for them etc. However, I would encourage people to make enquiries if there is something that they are interested in. I’ve discovered that there are a lot of things you can do without having to give up much of your time. It’s so easy to send a couple of emails and tweets whilst you’re sitting in front of your favourite TV show! Volunteering can also become part of your social calendar or your newest hobby. Bring some friends along and then you get to spend time with them but the work also gets done twice as quickly! Most importantly, it’s about doing something that you find enjoyable and fulfilling, developing your skills and also making a difference to your community. It is true that the most important thing you can give someone is your time! I think it’s important for charities like LEAP (who are diversity focussed), to have a wide range of volunteers who are different ages, races, genders, sexualities and from different social-economic backgrounds. Naturally, this introduces a large array of skill-sets into the group. This diversity also makes us stronger by maintaining a more balanced perspective on everything that we do.